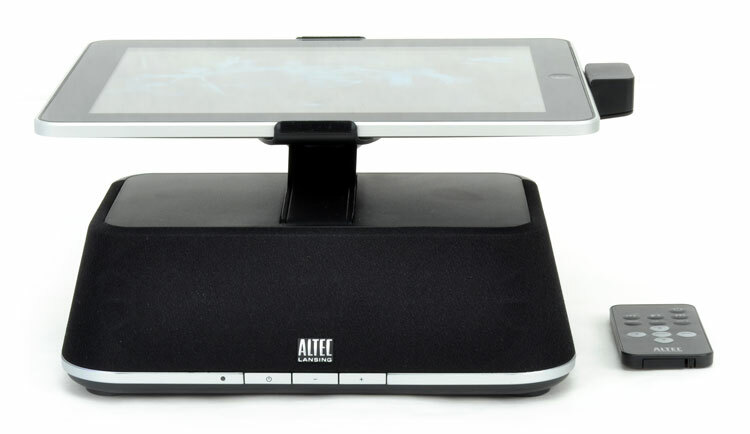 Even with a steep price tag, the Octive Stage MP450 by Altec Lansing stands out against the limited selection of iPad docks available on the market. When it comes to picking a speaker dock, iPod owners have no trouble finding a device for every taste and budget, but finding one for its larger cousin the iPad can still be a challenge. 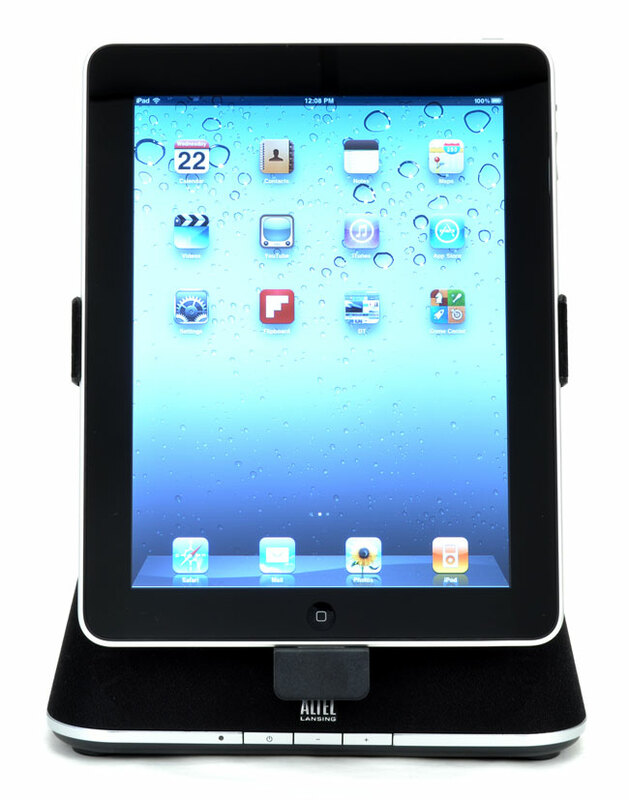 Altec Lansing’s Octiv Stage is a speaker dock for your iPad featuring a unique design in which the back brace and iPad connector are built into an arm that both rotates and folds backwards. the Octiv Stage works great in your bedroom, kitchen or any other area of the house, where you can take advantage of external speakers and software applications available on the iPad. Once the iPad is docked, you can rotate the screen to the desired position: landscape or portrait mode. We aren’t sure what the advantage to folding the iPad flat in the dock would be, but the option is there if you want it. In the kitchen, the docked iPad becomes a useful tool for listening to music, reading the daily paper, looking up that recipe or simply checking the weather. And in the bedroom, the iPad coupled with the Octiv Stage makes for the perfect nightstand companion: Listen to music while you sleep, check the weather, or download the popular Nightstand app to use your iPad as an alarm clock — complete with weather updates and sleep timer. The Octiv Stage features dual 2-inch neodymium drivers, an auxiliary input jack so you can use a non-Apple MP3 player, and a remote control (not compatible with non-Apple products). Sound quality is impressive for the size of the unit, but mediocre in a general sense. The bass, while fairly flat, is present, but ultimately distorts at high volumes. Highs and mids are also pretty flat and non-impressive, but the system overall does its job and works for watching movies or listening to music on the iPad. Overall construction is typical Altec Lansing quality, which is to say, better than most. The docking arm feels relatively sturdy, but we would recommend holding the bottom of it while sliding the iPad in to dock. The remote control has limited functionality, and still forces you to manually open the iPad application you will want to use. Once you have navigated to the application (for example Pandora), you can use the remote control to pause and play, adjust the volume, etc. The same rings true for watching videos; you will need to play the video using the iPad first, and then switch over to using the remote control. We presume most people will simply put the remote into a drawer and forget it, instead opting for using the touch screen on the iPad itself. 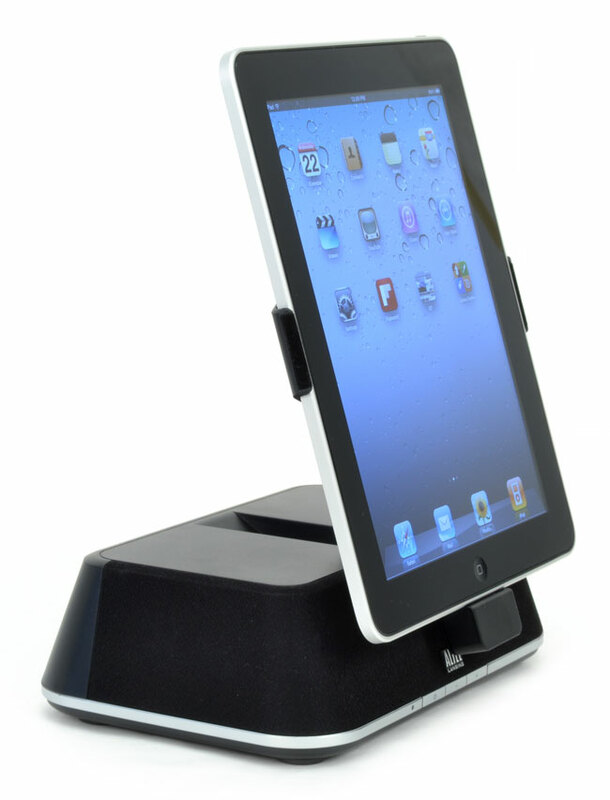 The Altec Lansing Octiv Stage is one of only a couple iPad docks available on the market with speakers. The $149 price is a little steep, but considering there are few competing products out there, it’s simply the best you can get. We would like to see better remote capabilities in the future, and possibly an integrated subwoofer, if Altec can somehow find out how to make room for it. Overall, the Octiv Stage makes a nice companion to the iPad and our dock of choice from the limited selection available now.